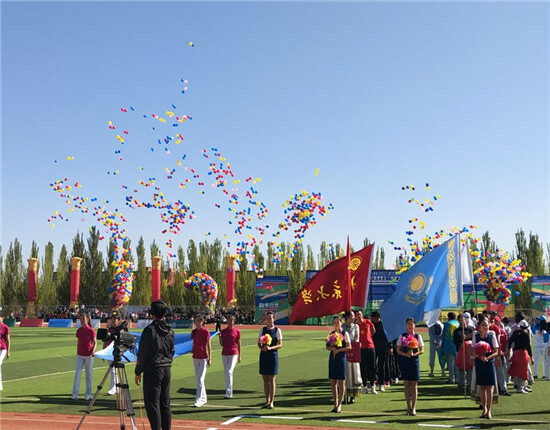 On the morning of Sept 22, a grand opening ceremony was held at Inner Mongolia Normal University's Shengle Campus for the "Jintong Cup" Silk Road International Collegiate Football Invitational Tournament, an event of the 2nd China-Mongolia Expo and 2017 Silk Road International Naadam Festival. Zhang Yamin, vice director of the Department of Education of the Inner Mongolia autonomous region, spoke highly of the football tournament's significance, saying that it will boost exchanges of sports culture among the college students and will spread the football spirit and friendship among teenagers to other countries involved in the ancient and modern Silk Road. The tournament will also provide a rare opportunity for the region to learn advanced experience in football teaching reforms, noted Zhang. One of China's neighbors, Uzbekistan, has attended the event for the first time. "Sport, as the messenger of peace and friendship, builds up people's body and mind, and also help people unite together," said Ogier Guyshonov, vice president of Uzbekistan's Tashkent State Normal University. He looked forward to further strengthening cooperation and exchanges in education, science and technology, culture and art with countries along the Silk Road, especially between their research institutes and universities. He was confident that sound bilateral relations in economy, trade and investment will be established through this opportunity. The 2017 Silk Road International Naadam Festival, organized by Inner Mongolia Normal University (IMNU), aims at promoting exchanges in education, culture, sports and arts among universities in China, Mongolia, Russia and other countries taking part in the Belt and Road Initiative. Compared with the previous two Naadam festivals, this year's event has enriched its activities and drawn wider popularity. 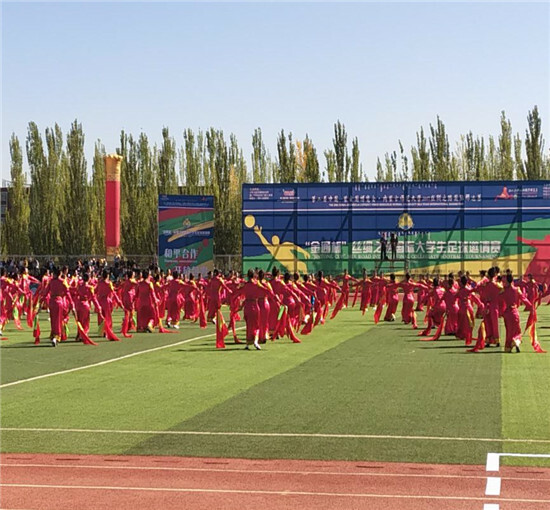 Besides the football tournament, there are a Chinese-Foreign University Presidents Forum, a Tuo Musi Oil Painting Exhibition, a Dunhuang Murals Art Exhibition, a Painting Exhibition of Chinese and Mongolian Teachers and Students and a Collegiate Traditional Archery Invitational Tournament. Eleven universities were invited to take part in the football tournament, including National University of Mongolia, National Education University of Mongolia, Lomonosov Moscow State University, Belarusian State University, Kazakhstan Nazarbayev University, Uzbekistan Tashkent State Normal University, Tajikistan State Normal University, Peking University, Renmin University of China, Inner Mongolia University and IMNU. This activity was sponsored by the Sino-Russian Committee of Friendship, Peace and Development, the Inner Mongolia Football Association and IMNU, and co-hosted by the Sino-Russian Foundation of Culture, Education, Science and Technology, and Development, the government of Horinger County, and IMNU. Officials addressing the opening ceremony included Wang Wenqi, counselor of the Department of European-Central Asian Affairs of the Ministry of Foreign Affairs; Menke Erden, consul-general of the Mongolian Consulate in Hohhot; Uyanga, from the Expo's organizing committee; Cui Shan, head of the Sino-Russian foundation; Bao Guanglin, government counselor of the Inner Mongolia autonomous region and vice general minister of the department of coordination of the expo; Guo Gang, vice director of the Bureau of Commerce of the Inner Mongolia autonomous region, director of the Port Office and vice minister of the department of coordination of the expo; Kurbanov Fatiali, representative of the Embassy of the Republic of Tajikistan in China; Zhang Yamin, vice director of the Department of Education of the Inner Mongolia autonomous region; Wu Gang, vice director of the Sports Bureau of the Inner Mongolia autonomous region and vice chairman of the Inner Mongolia Football Association; and leaders of participating universities. Among guests attending the opening ceremony were the following leaders and representatives of teachers and students of Inner Mongolia Normal University: President Yun Guohong, Vice Presidents Zhang Haifeng, Liu Jiuwan, and Zhao Donghai, and Party Committee members Wang Laixi, Burenjirigala and Zhang Baocheng. President Yun presided over the opening ceremony.